Makaravilakku – Makarajyothi is the most anticipated festival at the Sabarimala Ayyappa Temple. It takes place on January 14 or 15, evening (Makara Sankrama Sandhya) – the time when the Dakshinayana Punyakalam ends and Uttarayan or Uttarayana Punyakalam starts. There are numerous stories regarding the origin and history of the Makarajyothi and Makaravilakku. The most popular legend is that after defeating demon Mahishasura, Ayyappa merged with the Dharma Shastha Murti at the Sabarimala Temple on the Makarajyothi day. 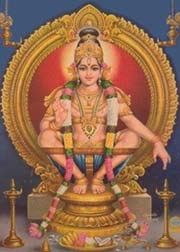 Makaravilakku is the Jyothi that appears at Ponnambalameddu three times on Makar Sankranti day after evening puja. Makara Jyothi is the star that appears on the sky during the Puja. Another legend has it that Parashurama first lit the Makaravilakku after installing the murti of Ayyappa. It is also believed that the tribals who were harassed by the demon Mahishasura first lit the light to celebrate the slaying of their tormentor by Ayyappa. Another popular legend also states that Parashuram installed the murti of Ayyappa on the day. While the murti installation was taking place, Indra, the King of Devas, and Narada Maharishi lit Makaravilakku at Ponnambalameddu.